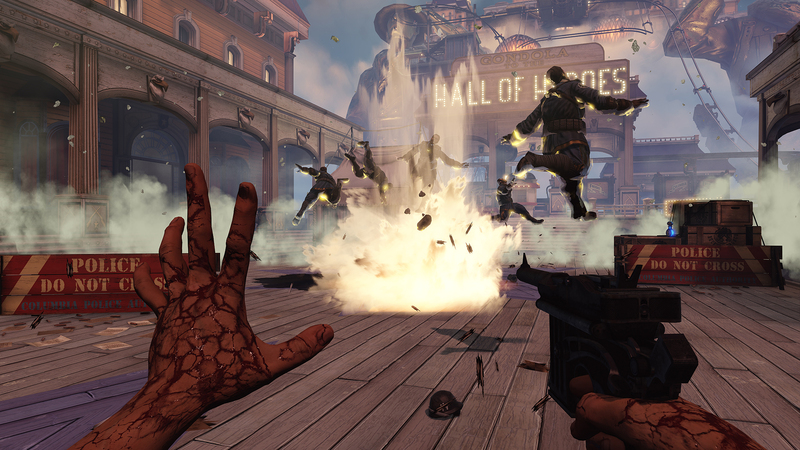 It’s been a very long time since a game as anticipated as Bioshock Infinite has released. With the prestige of being a spiritual successor to the 2007 classic Bioshock, many have had this game pegged as a potential masterpiece; able to claim the lofty title of “best game of this generation.” You know what? Those people just might be correct. The story of Bioshock Infinite is anything but simple but I certainly have no intention of spoiling it here. You are Booker Dewitt, an ex-Pinkerton agent in 1912 America. Dewitt is sent to the mysterious city of Columbia to recover a girl, Elizabeth, who is being held captive. Once he arrives at this city floating above the clouds, he finds that things are (naturally) much more complicated than a simple rescue mission. It’s difficult to discuss story aspects of this game without delving into spoilers. I will simply say that the story and the way it is told are entirely masterful. Each of the characters are deep and well thought out with terrific voice acting. Elizabeth is especially strong, which is necessary as she is the focal point of the game. 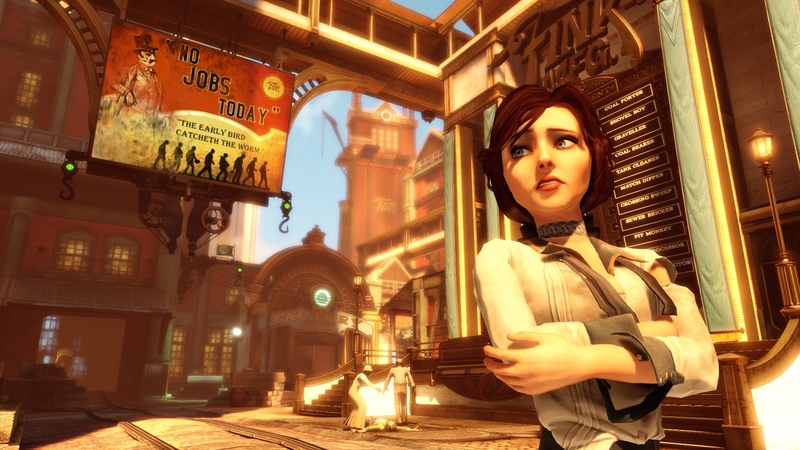 The best thing that Bioshock Infinite does in its plot is that it has great pacing. Each additional layer of intrigue is unveiled gradually over the course of your playthrough. It ramps up more and more as you near the finale of the game. The ending sequence is one that will leave you in shock and awe, with several jaw-dropping moments. Part of what makes the story so compelling is the world that has been crafted. It is clear that an enormous amount of time was put into Columbia. It is full of intricacies and small details that make it feel very much like a living, breathing world. You also get several chances to see Columbia as an actual functioning city instead of just a chaotic anarchy like in Bioshock’s Rapture. This help builds a connection to your surroundings that otherwise might not be possible. Part of what makes Columbia feel so alive is the great visuals and sounds. The game looks beautiful with remarkable vistas and plenty of great graphical effects with water and light. The characters follow a slightly stylized design that gives them a unique look. The music in the game is amazing from wonderful 1900s era hymns to expertly placed licensed music. Music aside the city just…exists, with dozens of side conversations and background noise that go a long way towards engrossing the player. There are a lot of things similar between Bioshock and Bioshock Infinite but one main difference is the overall feeling of playing the game. The original Bioshock very often felt like a horror game through and through. Infinite, alternately, is set in a bright, sunny world where some semblance of humanity still exists. It is still atmospheric and moving but without the constant fear that flowed throughout most of Bioshock. Don’t get too comfortable though, there are still times where the game messes with your head, including one massive jump scare. The combat in Bioshock is also quite similar to the original, and for good reason: it’s very solid first person shooter action. You have a variety of weapons to use such as pistols, machine guns, rifles and more. Remember we’re talking 1912 here, weapons are not complex. To add that extra flavor you also have a variety of powers, called Vigors here instead of Plasmids, which are equally as helpful in taking down foes. 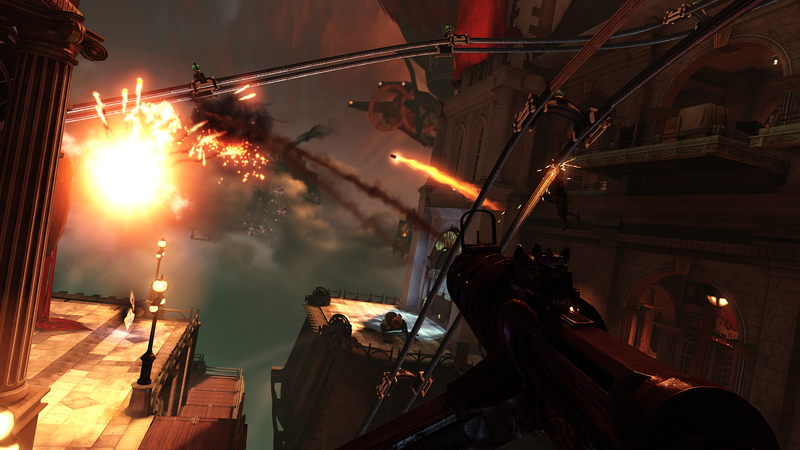 It is using the two in conjunction that makes Bioshock stand out from other types of shooters. However that is not entirely what makes the combat in Bioshock Infinite so interesting. Most action set pieces take place in large arenas instead of small rooms and corridors. The best of these are massive areas that also stretch vertically, adding a nice layer onto the combat. These moments take advantage of the Skylines, roller coaster-like rails that allow you to ride along to reach new areas, escape your enemies or simply engage in highly rewarding hit-and-run maneuvers. The variety of these battles is also broken up due to an interesting mix of enemies. If you’ve been following the production of the game you’ve likely already seen many of the unique foes such as the Patriot and Handyman. While none are as iconic or memorable as the Big Daddy, they do wonders to create interesting battle scenarios. As the thing that you are doing for most of the game, combat really nails the fun factor. The Vigors are great, the weapons feel right and the enemies are smart enough to provide interesting scenarios. The final pieces that pushes it over the edge into greatness is Elizabeth herself. She is with you for much of the game and, without spoiling anything, the way she assists you adds an entirely new level of intrigue and strategy. Games such as Bioshock Infinite just don’t come along very often. It covers all bases as far as game design goes. From a presentation aspect it hits all the marks: the world is beautiful, the music is great and the characters are well-crafted and believable. However, at the same time the actual gameplay manages to become one of the best shooters out there, with combat that provides plenty of strategy and amazing set pieces. Bioshock Infinite also provides tons of opportunity for exploration. You’ll want to spend the time to look through every cupboard and search in every corner so that you can find more money, discover upgrades or, most importantly, to find audio logs to learn even more about the world and the story. For Bioshock Infinite, that is ultimately what you will take away after you’re done: the story. It can stand as one of the best stories to ever be told in a video game, perhaps even in any medium. It twists and turns from beginning to end, offering a satisfying journey and a mind-blowing conclusion. It’s a story that provokes thought and demands discussion. When you finish the game you will immediately want to start a new game just to experience it again from the fresh perspective provided by knowing how everything wraps up. 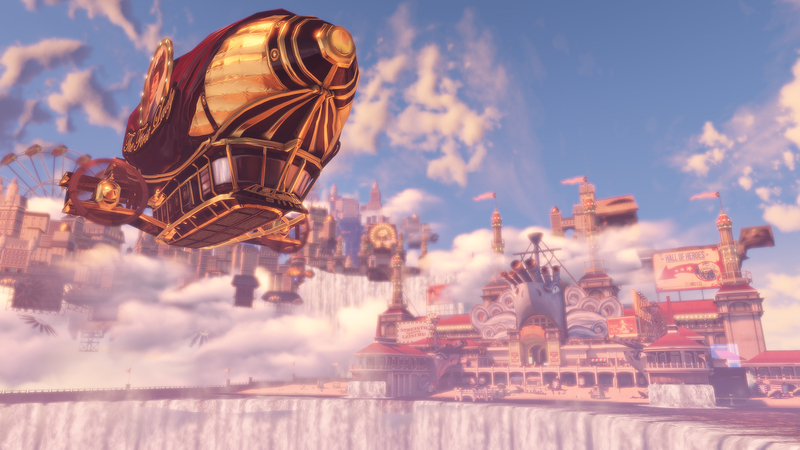 Bioshock Infinite is one of those few games out there that should not be missed by anybody. Is it the best game of this generation? Yes, I think it just might be.